Cellular/mobile phones have advanced by leaps and bounds over the last 25 or so years. British designer Kyle Bean puts it all into perspective with his Russian doll-style depiction of the evolution of cell phones. 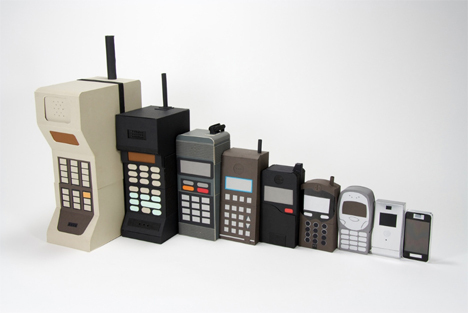 His project, called Mobile Evolution, depicts mobile phones from 1985 to 2009. Each phone nests within the next, with the smallest being the most modern and the largest being the oldest. 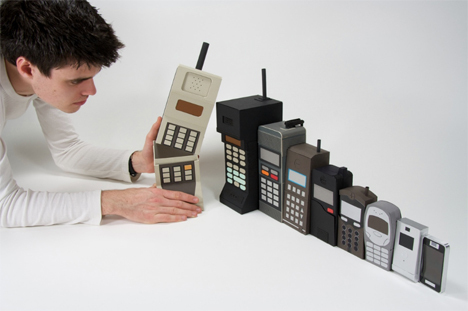 The phones shown are, from oldest to newest: 1985 Motorola DynaTAC, 1988 Nokia Mobira Cityman 1320, 1991 AEG Teleport, 1993 Ericsson GH 198, 1996 Motorola Micro TAC 650, 1998 Siemens C10, 2001 Nokia 3210, 2005 Motorola Razr V3, and 2009 Samsung Tocco. Seeing them all together gives a great visual idea of how far the industry has come in such a relatively small amount of time. 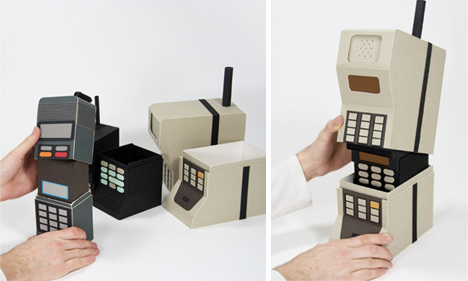 The intricate recreations of mobile phones are made of paper and cardboard. 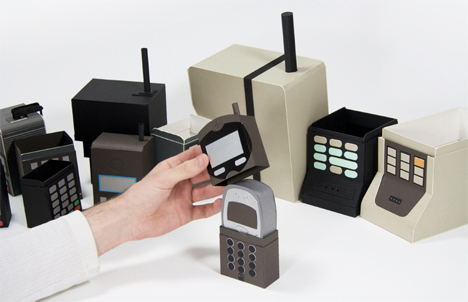 According to the designer, he simply wanted to illustrate how quickly mobile phone technology has advanced and miniaturized since the first generation of wireless phones was widely available. The display enjoyed a public exhibition at 72 Rivington Street in London over the summer. See more in History of Tech or under Vintage & Retro. September, 2009.